Many of you know me as a Denver City Councilwoman who fights for fiscal responsibility and who works hard to see that government delivers the basic services we need. We simply have to live within our means. District 2 voters elected me to carry that message to City Council, and today I ask them do so again. So, I’ve created this web site to provide important information about my background, my actions and my views on key issues. I’ve also included some unsolicited comments so you can see what others say about me. Election Day is May 3, 2011, but since this is an all-mail election, ballots will be mailed to you around April 14. Please support my re-election to City Council so I can build on my accomplishments and give you the strong voice you deserve. Together we can make Denver an even better place to live. to Citizens for Jeanne Faatz. 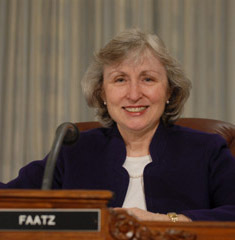 Make checks payable to Citizens for Jeanne Faatz. contribution limits for district council candidates: $1000. and occupation if an individual contribution. messages that you send to her.